There are many people who have been keeping dwarf rabbits as pets in the USA. It is ranked as the third most popular pets. The cute animal seems to attract a lot attention around the globe. The dwarf rabbits originated from the European continent and pet lovers have brought it out of the continent to be enjoyed by everyone. You too can keep the small rabbits as pet, but you will need to know certain things about the small bunnies before buying it. The dwarf rabbit should only be bought from a reputable and responsible pet store or breeder. Preferably you should buy from a store that is near your home. It will be easier for you to refer any question or problem with them in the future if you have any problem with the little fur. You can use the internet to help you learn about the dwarf rabbits as pets. Having the rabbits would be fun for your family and you. The cute and adorable look of the small guy will certainly help you to fight the stress that you been having at work. You can even train the little guy to learn a few simple commands. The dwarf rabbit can be trained to use the litter box just like a cat. The animal is an intelligent creature. Many people find it is easy to train the dwarf rabbit compare to other animal as pets. When you are going to buy the dwarf rabbits as pets it is recommended that you buy from honest and reputable pet store. This is very important to avoid from getting an unhealthy rabbit. There are many cases of newly bought rabbits died after a few days brought home. When buying the rabbit you should check the rabbit for a few signs that will indicate the rabbit is healthy or sick. You should observe the weight of the rabbit. It should not be too thin or obese. The rabbit fur should be stroke with your hand and at the same time you look for any mark of wounds or cuts. Clean skin is a sign of a healthy rabbit. The buttock should not have any liquid discharge which maybe a sign of diarrhea. You can also check the teeth and you should only buy rabbit that do not have too big and long teeth. 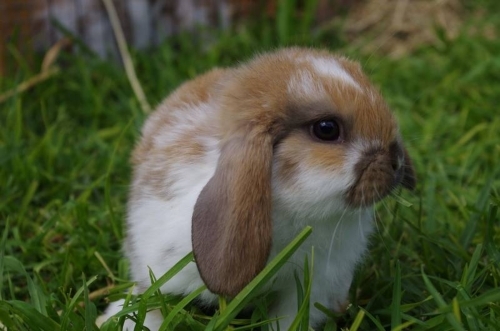 The place where you will be buying the dwarf bunnies as pets is also important to determine the health of the rabbits. You should see whether the rabbit is being place in a congested enclosure or not. A congested enclosure will cause stress to the rabbit. You should also make certain that the rabbit you choose is more than 8 weeks old. Buying a younger rabbits may cause heartache to your family and you because usually younger rabbit will die after a few days being brought home. Under 8 weeks old rabbit will need to be breast fed by it mother and separating them will only cause the baby rabbit to die at young age. So be humane by rejecting any offer of young baby dwarf rabbits as pets.